New beds with very comfortable mattresses! All linens are luxurious high thread count. Stunning 4 Bedroom 3 Bathroom House with an Office on 2 very private acres, with 600 feet on Slope Creek. 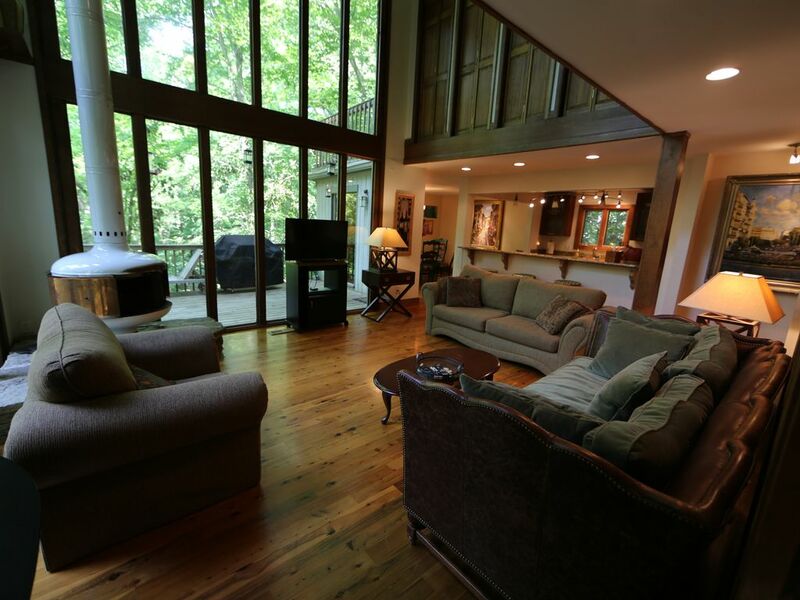 The living room (with a 40" Flat Screen TV) overlooks a waterfall on the creek. Very spacious home. Two (2) Kitchens, with the main kitchen (chefs) totally renovated last year with a Viking range and all extras. The house features a master bedroom with a king size bed and a 42" Flat Screen T; a guest bedroom with two (2) twin beds, a second guest bedroom with two (2) twin beds, a third guest bedroom with a queen size bed and an office. Also, there are 2 air beds. One car garage is attached to the house. 2 more spots for parking. We are not allowing more that 3 cars parked on the property. All utilities are included. WIFI. This home is not available for rent as a party space. No loud music will be tolerated. This home is intended for small groups, professional or family gatherings only. NO PARTIES ARE ALLOWED ON THE PROPERTY! Violators will vacate the property without any refund. NO parking on the cul de sac. 2 cars can be parked at the property plus 1 car in a garage. Total: 3 Cars. Stayed here as corporate housing. The house was very nice with a great view, located in a very nice & quiet neighborhood. We were absolutely charmed with this beautiful hideaway! The pictures on the listing make the house seem very luxurious and updated. The truth is that the finishings are very old and the house is rotting away. For the price, we were not impressed. We enjoy staying together as a family and understand that a large home will have a large price tag, but we hope to stay in a home that is clean, modern, and well furnished. The carpet on the stairs and in the upstairs bedroom is very old and dirty, the water system needs a filter for all the sediment and brown tint, the mattresses are uncomfortable, the downstairs is freezing cold because the fireplace flue is broken and won't close properly, and the oven has a terrible gas smell when you turn it on. This house does not reflect the cost. The location is nice, the creek behind the house is beautiful, and there are 4 bedroom areas. We would not be interested in staying in this home again. We are very sorry that the house was not up to your satisfaction. We take the appearance of the property and our guests very serious. We immediately have had the carpets cleaned and the Viking range serviced. Gorgeous Creek in the Backyard! Our families had a great time! The kids LOVED fishing in the backyard and caught a mess of brim (catch and release). The house has been updated, but could use some more updates. Also, the downstairs area (basement area) got very cold at night. We visited The Georgia Aquarium (25 minutes away) and Stone Mountain (40 minutes away) during our stay. My brother-in-law died and we had family from PA, NC, and FL all coming for the funeral. As our family had multiple deaths in short period of time, we felt we needed time together and a home large enough to hold all of us would be perfect. This house met those need and more. It was so beautiful the widow and her daughter kept visiting us for meals and to talk about her husband. The two levels allowed for privacy when we needed it. The setting was was quiet, serene and we took so many quiet walks! If it was not so cold we would have sat on the deck too! Stay here, it is so perfect! We totally enjoyed this wonderful home. It was as clean as any VRBO we have ever seen.